The wind is roaring up the Northwest Arm – not very cold, but strong enough that even in the shelter of the harbour, the pilot boat is tossing in a way that makes landlubbers feel queasy, even from a distance. 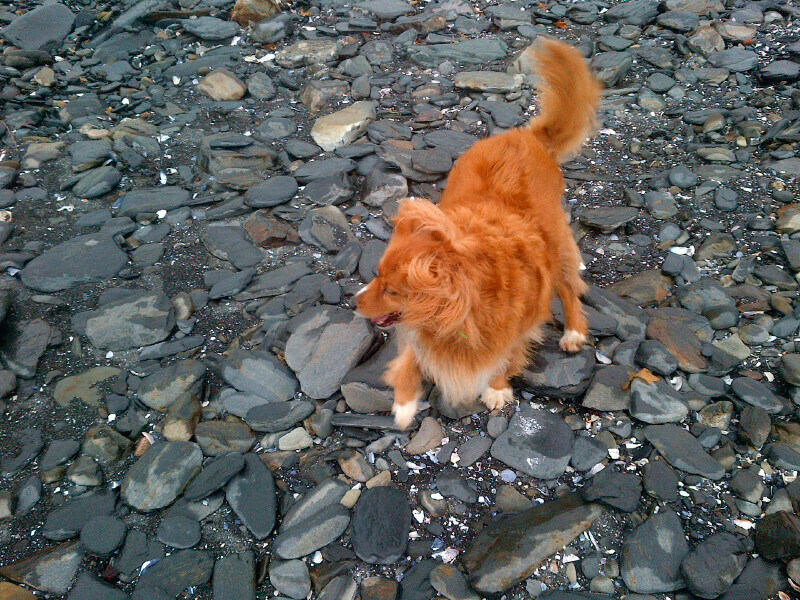 We are leaning into the wind as we walk along the shore in the park: Trouble’s ears like Piglet’s streaming backward, Human’s chin sunk deep into her scarf. 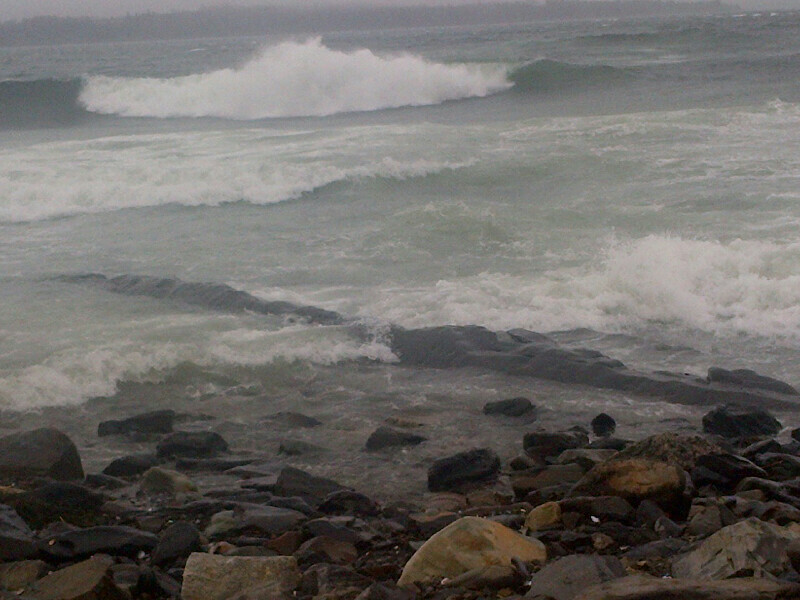 Waves are crashing onto the rocks, the wind ripping spray from their crests before they break. The air is salt. I am going to a funeral this afternoon, to celebrate the life of a woman younger than I, who died from the ravages of cancer. Yesterday, a young man, an invited guest, dropped in on a party to celebrate the end of classes at the University of Calgary, and stabbed five students to death. Every day, the news from Syria, Ukraine, the Central African Republic seems worse, the scale of fear and hatred too large to comprehend, or tackle. And it is Holy Week in my faith, when we walk toward a vile and shameful death with someone who was too good for this world, who wanted passionately to change it, and did so, though not quite in the way anyone expected. Down at the shore, we are acutely aware of every scrap of shelter, how even scrubby trees can break the wind, how in the lee of the old fortifications, the battering waves are muted. Instead we hear the trees sigh gustily overhead, and notice our own breath and heartbeat. I’ll seek the seas at Love’s behest, and brave another cruise. 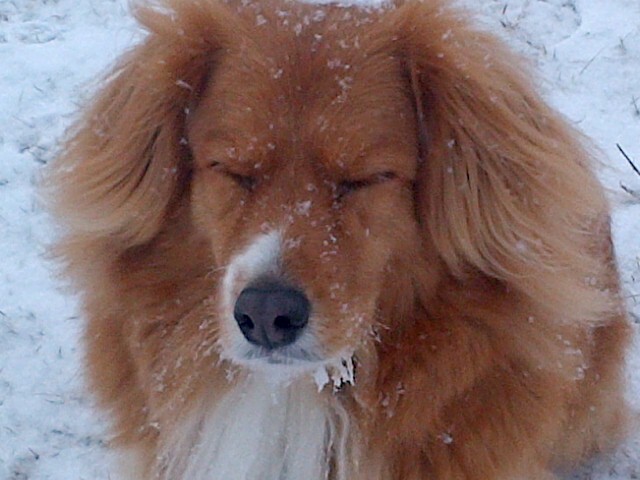 My dog’s name provokes many chuckles, affectionate recollections of puppy mischief. I may bring Trouble with me, but she brings joy. The world’s troubles are not like that. They are deep griefs, deep sufferings, and it is hard not to be troubled, hard to trust that hope does light the water’s crest, that there is a pilot boat – and a pilot – in every harbour, that the wind that knocks us sideways is the wind that lifts the sail. Tomorrow Trouble and I are going to spend some time with college students who are writing final exams. Love uses even the frailest craft in the humblest ways. Jessie Adams (1863-1954) wrote “I feel the winds of God today.” It is sung to the traditional tune “Kingsfold.” I have taken some liberties with the original text. 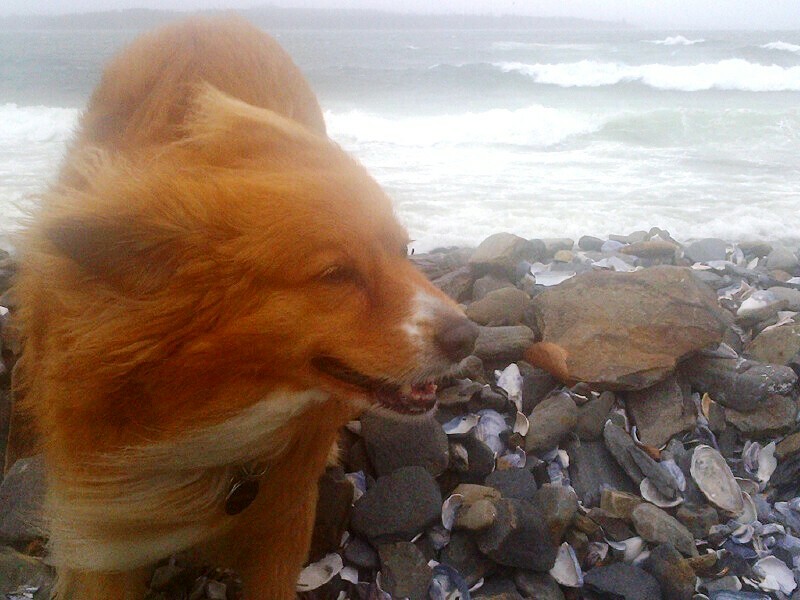 This entry was posted in Exam writing and tagged "winds of God", Holy Week, Jessie Adams, Point Pleasant Park, toller, trouble on April 17, 2014 by Susan Drain. It was pretty close to heaven. A whole room full of young people, all of them ready to get down on the floor and rub her belly. 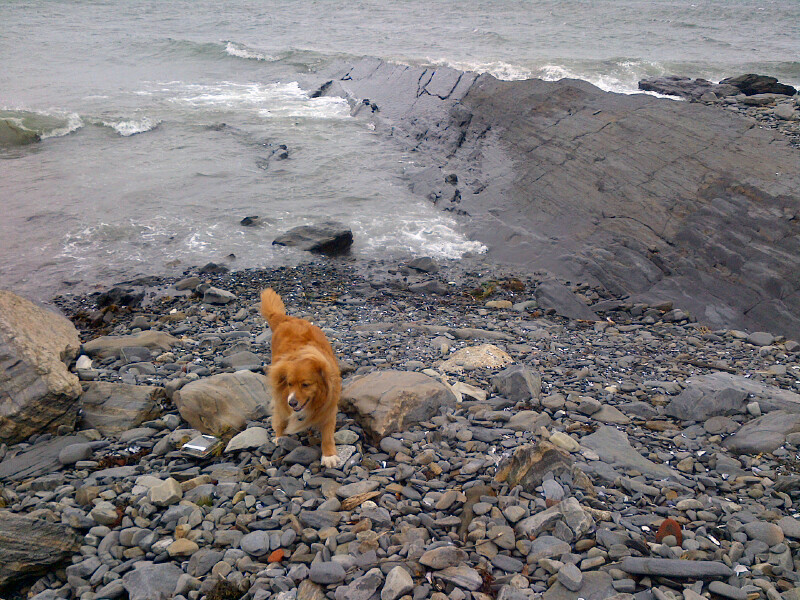 There was a certain amount of squealing – “so cu-u-u-te” – and a few moist eyes – “I miss my dog.” One young man approached in perfect play invitation posture – bum high, head and arms low. Trouble looked at Human for guidance – “is this guy crazy or what?” Then she rolled over and presented her belly. He obliged, though he clearly would have preferred to tussle. Welcome to exam time, when almost any activity is more attractive than studying. Human remembers spending hours in the cafeteria, lunch long finished, carefully tearing strings of paper dolls out of folded napkins in an impromptu competition. There were no dog therapy rooms during exam period then. Today’s students talked about the sudden attraction of housework. They talked about their all-nighters finishing their last term papers. They talked about multiple choice exams and whether they were better or worse than essay-type ones. Then they talked about Trouble’s fur, and how they missed their pets, and what kind of dog is this anyway? Exam time, and spring – the reluctant Nova Scotian spring which is more like the retreat of chill than an inrush of warmth, more likely to show up in patches of mud than in patches of flowers. Heard in rushing water, seen in the creeping rise of snowmelt. Some of the kids are rushing toward the end of term, swept along in a torrent of caffeine and group panic. Others pile sandbags, in the form of colour-coded study schedules and special scribblers for review notes, to control the flood. Some huddle outside the exam hall, stoking their anxiety with last-minute questions; others stride purposefully past without a sideways glance, extra pens in hand, a spare battery for the calculator in their pockets. Trouble has all the right strategies for exam time. Multiple choice exams are a bit like morning walks on garbage collection day: you sniff carefully around the possibilities, pass up the clearly undesirable bits, and assess the remaining options, quickly, knowing that it will soon be time to move on. 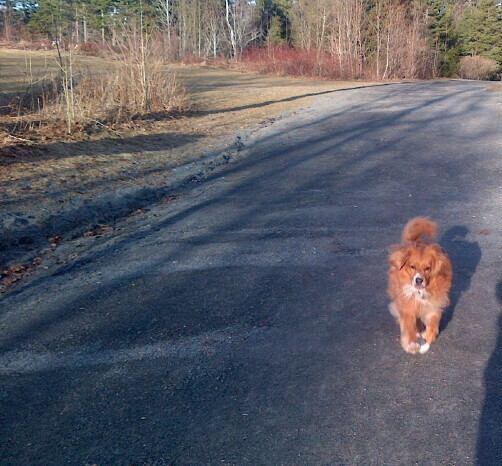 An off-leash walk on garbage day would be even better: Trouble would move quickly from one bag to the next, getting the easy pickings, looping back later for things harder to sniff out. Dream on, Trouble. Garbage days are always leash days. 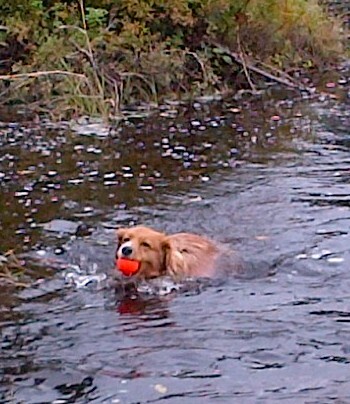 Essay exams are more like retrieving: there’s a human reader involved, not just a tally sheet, and humans, Trouble knows, are impressed by focus and drive. When the ball goes overhead, you go straight for it and bring it right back. You don’t dawdle off on a foraging expedition or meander around the field in search of sticks or a food wrapper. Answer the question right off, and you can practically hear the reader breathe a sigh of relief – here’s one who knows her stuff, one who knows what he’s doing. Even when she brings back the wrong ball – it happens – Trouble gets praise because she’s shown she knows what to do, even if she hasn’t quite done what was expected. It’s called “showing your work” in math problems; it’s called making an argument in the humanities. Focus and drive. Better than luck any day, whether in a field trial or an exam hall. 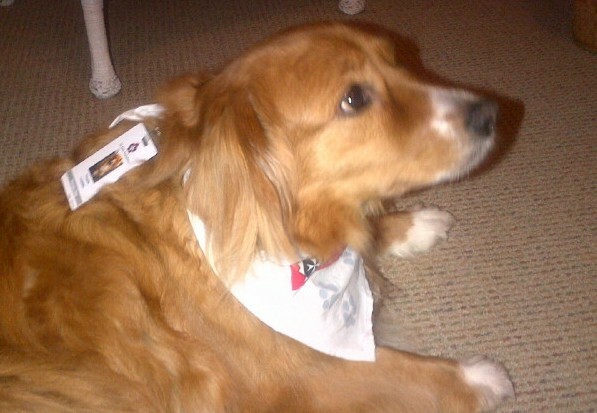 This entry was posted in Exam writing, Therapy Dogs and tagged belly rubs, exams, focus, garbage day, heaven, multiple choice, procrastination, readers/audience, retrieving, spring, therapy dogs, toller, writing on April 10, 2014 by Susan Drain. 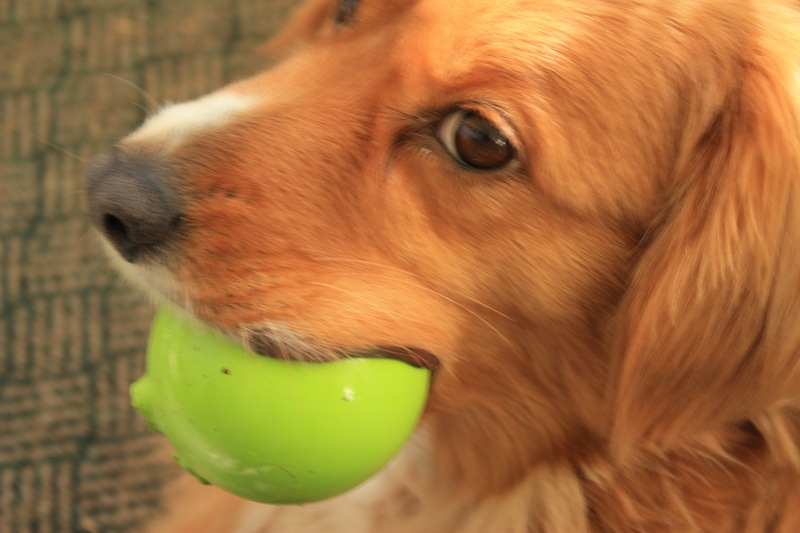 If she likes doing it, Trouble easily finishes what she starts … whether it’s a dish of kibble or the systematic extraction of a squeaker from a toy. 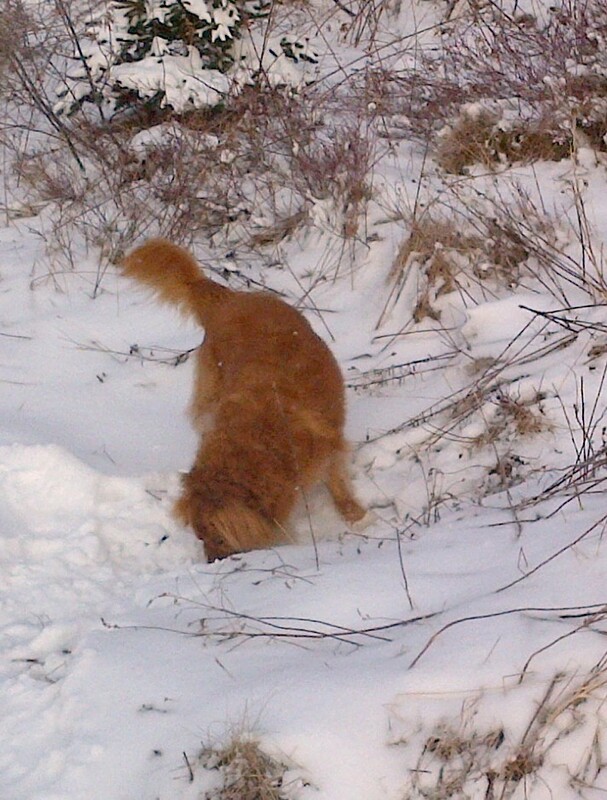 If a ball bounces unpredictably and she loses it, she’ll circle in search of it until she’s called away. When she misjudges a stick in the river current, Human is quick to call her back, for fear she will swim too far downstream after it. If there’s something she doesn’t much like (teethbrushing, say), she can be brought by degrees to tolerate it, with very short periods of exposure and lots of rewards. A crumb of dried liver is very persuasive. Human, by contrast, finds it easy to leave things unfinished – not a bowl of ice cream, maybe, but a blog post, say, begun last week, and set aside. 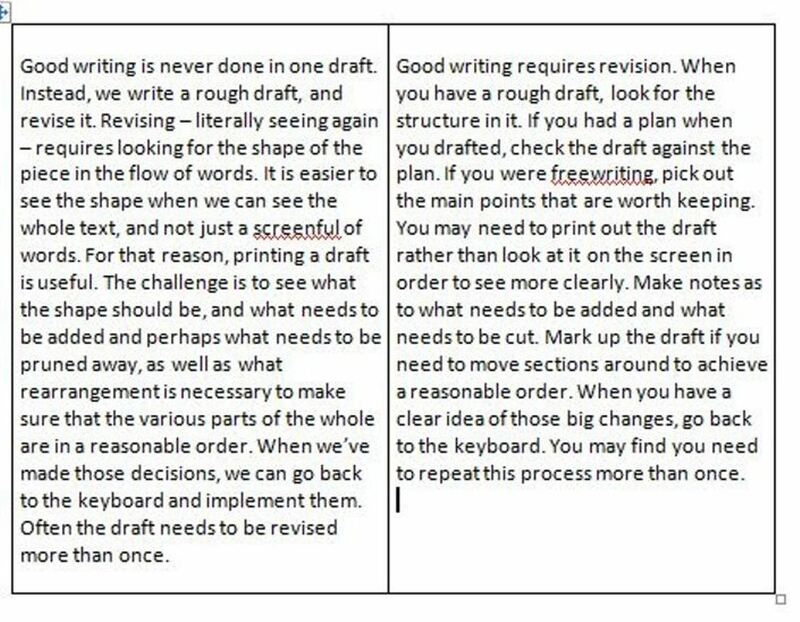 It’s not just procrastination, because a draft set aside often looks quite different (sometimes even better) when it’s taken out again. If there’s no deadline to bring urgency or desperation to the task, however, it’s hard to pick it up again. Still it’s not very different from brushing Trouble’s teeth. “It’s only for a minute or two.” I don’t have to finish the thing; I only have to read it through and see if there’s a shape in there somewhere. Scribble some notes, jot down an “aha,” and see, that wasn’t so bad after all, was it. So Human returns to that exercise in revision she’s been working on in several of these posts, promising herself a nice piece of dark chocolate with sea salt when she’s got another draft worked through. Again, she sits on her hands while she reads, resisting the temptation to correct. More important right now to think about how it might reach a reader … and that’s going to take some decisions. Is this meant to be a description or a prescription? Often the rhetorical situation is already given, though it still needs to be thought through a bit: if the purpose is to describe the process of revision, and the reader is, say, a student who is struggling with the whole process, who is the writer in this context? A wise and friendly mentor? On the other hand, if it were to be prescriptive, choices would be different, even for the same reader. “We” might give way to “you.” The whole thing would be directive. One of the differences between writing and squeaky toys is that a chewed-over draft eventually produces something better than the original. It may take several revisions, and then finally, we can make the editing changes and corrections that make the text a joy to read. Trouble’s basket of toys, on the other hand, is a sad collection of frayed edges, missing bits, and things that make moist squelchy noises rather than crisp sharp squeaks. Here are two different results of the revision process – we’ve spared you all the in-between stages and the final editing. You decide if they’re truly chewed up squeaky toys, or something with a bit of life left. 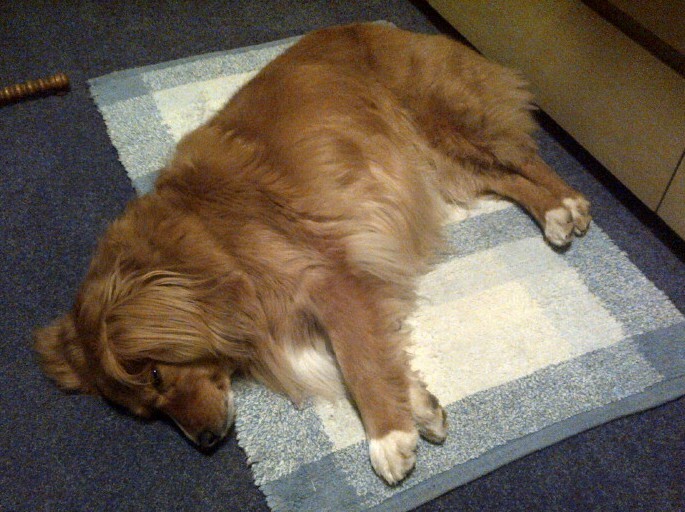 This entry was posted in Revision and tagged description, persistence, prescription, procrastination, readers/audience, revision, rhetorical situation, squeaky toy, toller, trouble, writing on April 3, 2014 by Susan Drain.